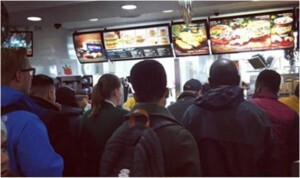 If you have managed to read the first 2 parts of this series of blogs you will appreciate the reasons why queues happen, how our customers interact with queue management systems and looking at the efficiency and design of some of the more popular queuing systems. In this part we are going to assist in providing a bit more thought into queues. After a welcoming greeting to their place of chosen entertainment, passing swiftly though a well managed and designed queue management system, our customers enter our venues looking to enjoy their day or evening. Well done, you have done your job; have you not? You managed to get all the customers into the venue in the smoothest and quickest way possible, surely there is nothing else for you to do? This small list is possibly the most common feature of any event based facility. Toilets are a necessity for our customers, after that it is a nice to have but something our customers now look for. They may look for food and drink to assist them enjoy there day out, a cloak room to assist look after those winter coats they do not want to carry around with them and retail out lets allow our customers to purchase something to remind them of the day. These facilities also assist our venues and promoters to generate additional cash flow for them and as such are a vital part of their operation. Now, part of you may be saying “why should I care about them selling, pints, burgers, t shirts and stuff, I do security!” Well, we will help you right there with those thoughts. Your venue of employment is out to do one thing, make money. With that money they book more entertainment- entertainment brings in customers. These customers need to be looked after and the venue employs you to do that. Customers are happy and customers return. How easy is that? If you are thinking of taking the moral high ground about how much money they make, you are fighting a losing battle; someone has to be a winner and it very rarely the consumer. All forms of customer based events are basically the same – sports events, street parades, live music and so much more. We rely on the customers enjoying themselves and returning, without them, there is no industry. So let’s look at each area and see what implications queue management has or the lack of it. There is nothing better than going to a gig, having a cold pint and watching your favourite band and we could say that for most live entertainment. Having a drink with your choice of entertainment is part and package of the event and a vital part of a venues revenue stream. We will look at this for indoor / purpose built venues and then temporary constructed venue. To cover this in depth we would have to look at every style of venue from small club bars to sports stadiums, music arenas, etc, would take a substantial amount of time. There are some things that we can consider to be very similar across all the venues; bar size will be in relation to the size of the venue and the capacity and staffing levels will be in line with the consumption of customers. After that the variety of venue, design, size, layout, and construction makes every single venue unique and throw up challenges. Traditional event spaces in most countries would be theatres, community halls and exhibition halls. 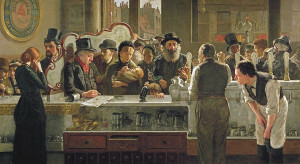 Bars would have been incorporated into the design of these buildings, providing refreshment for customers. Through the course of time these facilities would have been upgraded and adapted to match the profile and consumption of customers. Hopefully these would have been thought out, taking into consideration space and flow; but if we were being honest the want to take customers money would outweigh the sensibility of customer management. 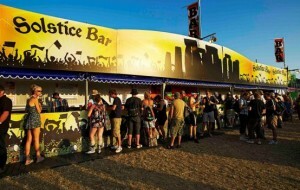 Designs of public bars in traditional event spaces, would be more likely to have the bar in a separate room. 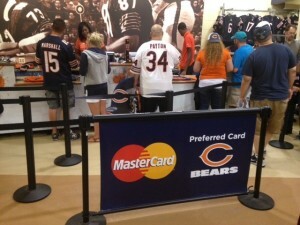 This would allow customers to be segregated from the greater population of the venue. Like any event spaces though, this now, would have a capacity, which has to be adhered to. Originally, when built, the chances of capacities being thought about for bars would have been a glint in the eye of a government official. 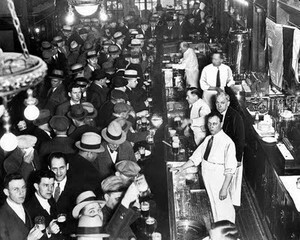 Even today, I am sure you could walk into a bar and be met by a wall of people, having to squeeze your way through to get to the bar or the toilets. To the majority of the people using these facilities, they would not even contemplate this; the bar would just be busy, these thoughts are saved for us few that have to consider these things in out working roles. Presenting yourself to get served at a traditional bar is something that we are indoctrinated into through trial and error. A good barman/person will be able to tell who got to the bar first and serve everyone in order. To us though, this may seem like organised chaos, although, very rarely do we complain about it. Through time we have accepted that this is how a bar works and we understand the process we are going through. There is also the feeling of winning sometimes when you go to a bar. This is when you manage to get served faster at the bar than those that arrived before you; a small victory, but always a good feeling. When a venue has been created out of a building that has had a previous use, such as cinemas and bingo halls in the UK being turned into music venues, bars will have to be incorporated into these spaces. There would have been consideration given to the location and layout to achieve maximum service without impacting on the capacity of the venue. Through time purpose built event spaces have incorporated the guidance and laws in relation to building a venue to be used for public entertainment. When we look at modern arenas and stadiums, the customer experience is foremost in the design of the public spaces. There is now an understanding of how customers interact with one another and the facilities provided. These venues have been designed by architects and passed through checks and now a days, computer designs, 3D walkthroughs and hopefully tested for crowd dynamics and emergency evacuation (there really is no excuse these days for large venues). It is not until customers are finally introduced though do we finally see if all that planning worked. Bars may be allocated to an area to provide the best service to the customer, but can they determine how they will interact with that bar, especially when it comes to forming queues. Where do people start queuing? Has signage been installed letting customers know where to stand? Is there a barrier system? Are there multiple points of payment (a cash register is generally accepted as the place to queue in front of)? Places of mass gathering such as music venues and stadium now no longer look like a traditional bar, more like a fast food restaurant. With this comes an element of uncertainty when first using them. It is only after visiting the facility a couple of times does our customers starting to feel comfortable with the use of the outlet. 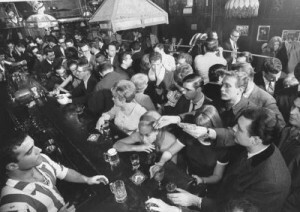 As we have just suggested, a bar is normally a service that customers visit multiply times during an event. So unlike the main focus of queue management being on customers entering a venue, bars will see customers queuing throughout the event; something that can often be over looked. A venue will spread the load of the customers over the facilities in the venue, to create quicker service, but it would be wise to monitor the use of the bar facilities to see if there is a build up of customers and queues forming. An outdoor venue should be a crowd manager’s dream when it comes to managing queues, after all the sites are custom built for each event. This should mean the bars are located in prime locations for customer use and revenue. These bars will match the profile of the audience and the event size. 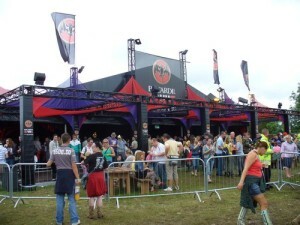 Small scale bespoke events may have craft beer and wine stalls, champagne gardens and such; large scale festivals may also have this, but alongside the industrial size mass servicing stations. The idea behind these large scale industrial bars is to serve as many people as quickly as possible. 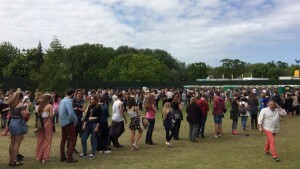 The last thing you want at a large scale outdoor event is huge queues at the bar. 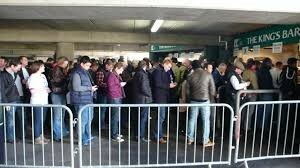 Customers feel as though they are missing out on the event they have paid for when waiting in a bar queue. These facilities are designed for the peak trade. Like most events this is during the intervals or intermissions of the event. 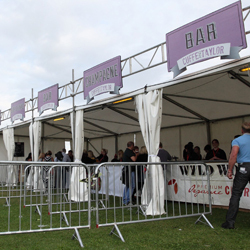 It is during these small periods that customers will head to the bars, toilets and refreshment stands. The ability of the bars is to process as many customers as possible during this time, so preventing frustration and potential loss of revenue. The queue management system implemented should reflect the profile of your audience. If you are having an event such as Proms in the Park; industrial looking barriers might not fit the profile of your customer. But, if you are having a large scale event where the audience is more energetic and problematic, front of stage barrier might be required for the management of the customers. Each profile presents its own requirements and it is our job to make the correct decision. 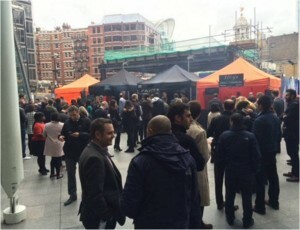 Just like the bars in our venues, catering units follow the same issues with queues; although maybe not to same extent. It is possible that the high percentage of our customers will use the provided catering facilities, especially if it is an all day event. It is less likely that more traditional venues will have such facilities, as they are aimed at visits of short periods of time; mainly in the evening. Stadiums and other large venues will have catering facilities, as this is seen as part of the event; the traditional pie and Bovril when you go to the football (if you are not familiar with this tradition, you do not know what you are missing out on!). A football game is a prime example of a facility having to deliver a service during a short period of time. The longer a fan has to spend at the snack bar/catering unit, the longer they are away from observing the field of play and may miss that vital goal or controversial referee decision. Older stadiums are trying to adapt to the requirements of the modern sports fans, in buildings that were never really designed for. 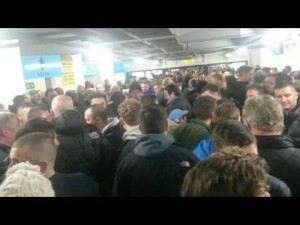 These images are typical concourse areas in the majority of stadiums at half time. It is a rare occurrence that a stadium is designed to hold its entire capacity in the internal areas. Even if they where, this does not take into account people trying to queue. The same can be said about the catering facilities at outdoor events. In recent years he have become used to the burger units selling convenient fast food to service our needs. But are our need changing, are we expecting more for our money. It is common to attend a large outside event now and see food outlets selling all type of food from around the globe; Pizza, noodles, curry, pretzels, salads, ice cream, pancakes, traditional food, sweets, etc, etc. You name it, you will find it at an event. Some of these foods can be served fast, others take a bit of time. This service time should be taken into account during your planning stage. At this point, I would like to put in a personal observation that caught me out at the time and something I would never have thought of, but now I think about during my planning. During a recent visit to an International Rugby stadium; servicing 60,000 customers, I came across a rather unusual thing. I headed towards one of the large bars they had on site to see the bar very busy and the queue management system packed full of customers. But, there was a large single file queue heading in the opposite direction. This got my interest and I started to follow it, only to find it starting at a Fresh ground Coffee and donut stall. This took me back a bit as i looked at a queue of about 100 people, queuing for coffee and donuts. I watched for a while, then went about the rest of the site to return later to see that the queue was back down to a hand full of people. What was this, so I spoke to the stall to find out if it was a special offer, giving away free coffee…what had caused such a large queue? They informed me there was nothing special that they were doing, but they had been rushed off their feet the whole day. So, over the next couple of hours my mind kept returning to that queue. Why did a coffee bar with no deals have such a large queue? I returned to the area just before leaving and the penny finally dropped. I looked at all the rest of the refreshment facilities; burger vans, pizzas, noodles and the bar. 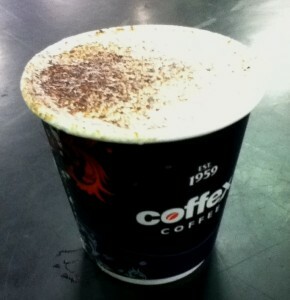 It was the only stall serving fresh made coffee. The rest all had instant coffee or tea, but this one was just like going to Starbucks or Costa coffee (other brands are available). We as a nation have fully embraced coffee culture and we look for good quality products. On this cold day, those that did not want to drink beer or wine, carbonated drinks or poor quality coffee, were willing to spend time waiting on getting a product they were happy with. Never had it occurred to me that this would happen, but as they say everyday is a school day. Every venue has them, hopefully there are enough and there are no queues. Just like the bars though, customers may use this multiple times through the period of time they are in the venue. And, just like the bar this is likely to get busy at peak periods. In indoor venues, customers will queue in the most continent way possible; if there in a wall or barrier near they will tend to follow this, if not, they may need a bit of guidance. The same can be said for outdoor venues. The event guidance lets us know how many toilets you will require for the amount of customers attending and normally a few more just for good luck. If you are in an outdoor arena, these will be located in an area close to the place of entertainment, bars, slightly away from food serving areas and normally near the entrances and exit. There are a couple of things you might want to think about though when it comes to toilets. The first being that ladies can take longer to go to the toilet than gentlemen. We can give you a moment to think about if you wish, or we can just accept this as a fact and move on. 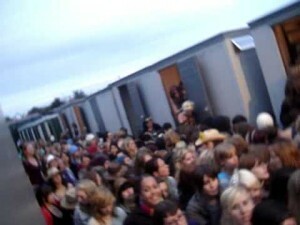 Due to this, you will tend to find queues of ladies waiting to use the toilet at most events; something that is sometimes over looked. The next is what can be scientifically proven as the Pint to Pee ratio (no real science was used in the construction of this ratio). If you think about it though, the more you drink, the more often you have to visit the toilet. This would suggest that if your audience have a low consumption of alcohol, then the toilets should operate as normal. But, if you have a high consumption audience, the toilets are going to be used on a regular basis. 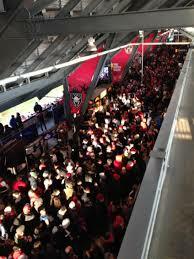 For year round venues, there is not a lot you can do about this change in demographic, as you have fixed facilities. It would suggest that you have to put some sort of management in place though. For temporary venues though, you have the flexibility to meet demand. Again, the deployment of crowd management personnel to the facilities would ensure more efficient use of the facility and also the customers behave in an orderly manner. 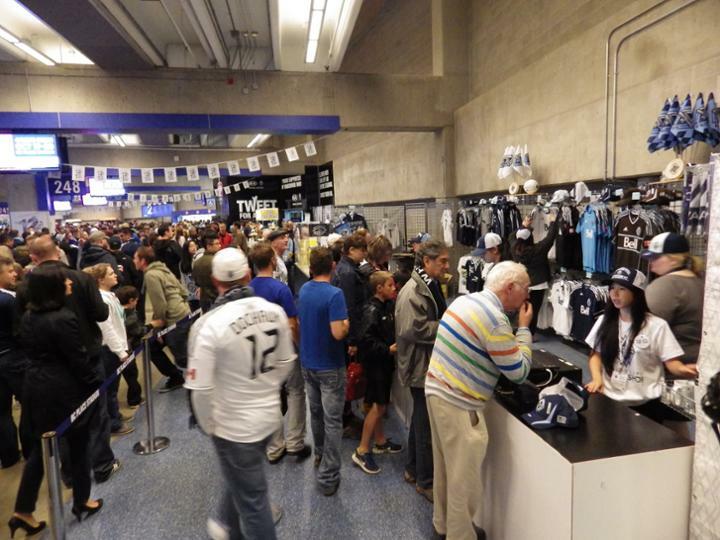 Many indoor venues provide a cloakroom facility for their customers. Depending on the season and weather, this facility can be either well used or a nice to have for customers. 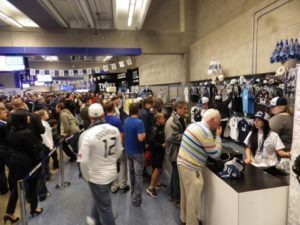 If the facility is provided though, it should have the capacity to hold at least one item for every customer in attendance. Or, you calculate a projected level of use, build a facility to hold that much and after that customers would just have to be told it is full. Use of a cloakroom is gradual on ingress as customers are spread over a period of time. It is at the end of the event that we have to look at when it comes to a cloakroom. I am sure that this is commonsense to the majority of the readers of this blog, but a few may be new to this concept. The audience that took a longer period of time to hand in their belongings are going to arrive on mass at the conclusion of the event. The amount of items in the cloakroom determines how big a queue you might get and if you require any management. 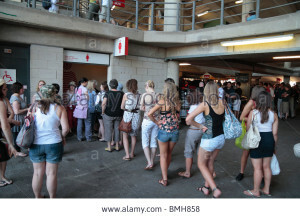 It should be remembered that this possible queuing will be happening during an egress. 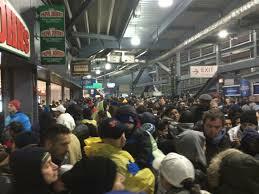 With this in mind, you will need to ensure any queue should not impede exit passages or routes. Customers will also be looking to leave as quickly as possible; either to continue their evening entertainment or head home. They longer they have to wait the more likely the customers may become restless. Depending on the audience profile this may be polite complaining to possible crowd disturbances. A vital part of many forms of entertainment is the revenue that they bring in from merchandise. This means that somewhere within your venue there will be a stall or booth selling the official merchandise. Depending on the popularity of the band/sports club/ celebrity, this could range from books to t shirts to novelty items. When we say popularity, that could be misleading; of course to the people there they are popular. What we mean is that certain audience profiles and demographics have a tendency to spend more money on merchandise that others. An example of this could be the latest Taylor Swift tour; the merchandise outlets where inundated with customers and the average spend was far higher than any other tour that year. Although the chances of queuing at these areas are less likely on the scale of any of the other service, they should still be taken into account and monitored if needed. Now that we have looked at each area individually, we should consider the whole picture. In each of the areas we looked at, we have suggested that there is a possibility of queues being formed. Individually these may not seem to be problematic, but what happens when they all happen at the one time? 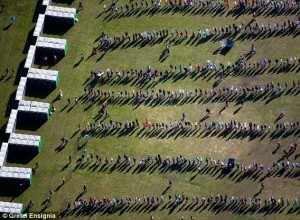 Has your venue been designed to accommodate all these queues without interrupting the available circulation space? 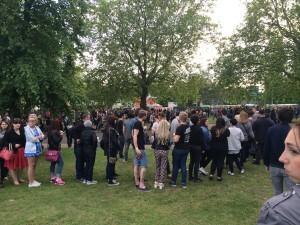 Has there been queue management designs been incorporated into the design of the venue? If it is not, this can lead to an interesting first use of the venue or site. You may find yourself problem solving all day or if you are not paying attention, possible complaints or injury. Queues are not just something that happens when customers are entering your event space. They can happen anywhere a customer is using a service. There is a possibility that these potential queues can be overlooked and it is our job to look out for them and plan for them before they happen.